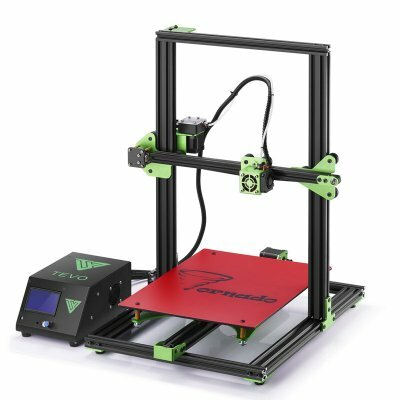 Successfully Added TEVO Tornado 3D Printer - DIY Kit, Wide Filament Range, Large Building Size, LCD Display, Offline Printing, High Precision to your Shopping Cart. If you have always dreamt of entering the world of 3D printing, the TEVO Tornado 3D printer is perfect for you. This affordable 3D printer comes in the form of a DIY kit. With its simple instructions, this kit allows you to easily build your own 3D printer. The body of your 3D printer has been crafted out of high-end aluminum, making it durable and extremely stable. Thanks to this, you’ll be able to smoothly print beautiful high-precision objects at any given moment. Simply insert your design, and you’re ready to go. From now on, you’ll be able to create anything your mind can imagine. With the TEVO Tornado 3D printer, there is no limit to what you can create. This cheap 3D printer kit features a large building volume of 300x300x400mm. Therefore, you won’t be limited to printing small sized objects. The printer itself is easy to install and, once in place, simple to operate. It comes with an LCD control panel and it supports offline USB/TF card printing. With a printing speed of 150mm per second, this DIY 3D printer will create your upcoming piece of art in absolutely no time. Your gizmo supports high-precision printing, meaning that you’ll always be treated to a beautiful and detailed end product. By supporting a wide range of different filaments, this 3D printer is great for creating any type of item. Whether you’re a teacher, hobbyist, artist, or engineer – this 3D printer but is sure to meet your demands. Thanks to its compact design, it can be easily stored in any workplace or office without taking up too much space. The TEVO Tornado 3D Printer comes with a 12 months warranty, brought to you by the leader in electronic devices as well as wholesale 3D printers.. Recommended extruder temperature: 210 Degree Celsius (the maximum can be set to 260 Degree Celsius).